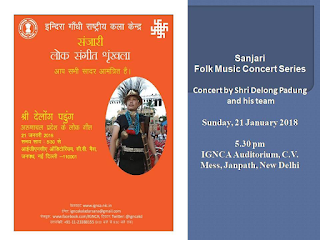 IGNCA initiated a folk music concert series, Sanjari on 19 November 2017. Under this series, senior artists are being invited to present musical concerts on folk traditions from all over India. 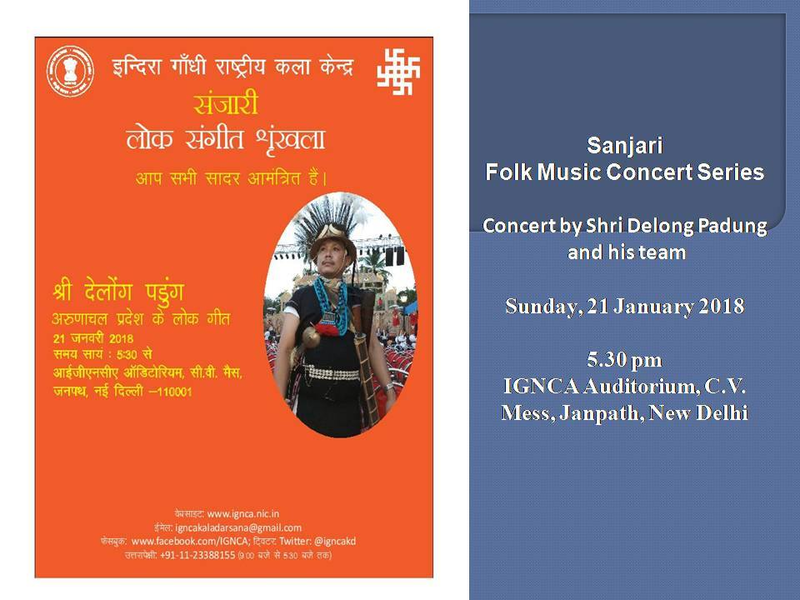 The 3rd concert under 'Sanjari' will be presented by Shri Delong Padung and his team from Arunachal Pradesh. Shri Delong Padung was born in 1981 and inherited his love for folklore of Arunachal Pradesh from his fore-fathers. With degrees in History, Education and Journalism, the artist has performed at several popular events of North East India including Arunachal Festival, Itanagar, 2014; the National Mega Event, Sarhad O Swaranjali, Itanagar, 2013. Shri Padung has been bestowed with meritorious awards from the Government of Arunachal Pradesh and Sangeet Natak Akademi. He also been made a member of National Expert Committee for the Fellowship Scheme for Folk, Traditional and Indigenous Art.